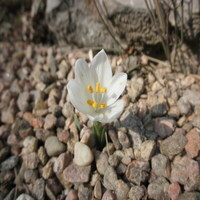 Saturday's warm weather drew out more bulbs and other early bloomers, and finally its beginning to look like March should. March belongs to several genera in the rock garden, Crocus, Galanthus and Helleborus are just a few genera that shine in March. I hope to do a blog on both Galanthus and Helleborus in due time. 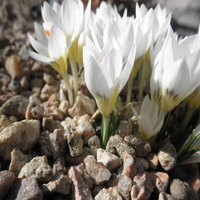 While many of the crocus where open yesterday afternoon, Crocus reticulatus pictured above, is perhaps my favorite crocus. Still closed up deep in the shadows, the reverse of each bloom is a work of art. It is especially beautiful as each bloom opens revealing the interior. I'll try and post a photo in my next blog. Iris reticulata cultivars have been getting well deserved attention now, and Iris 'Pixie' pictured above makes up for it's smaller size with the intensely deep color of its flowers. It graces the top of the waterfall at the highest point of the garden. 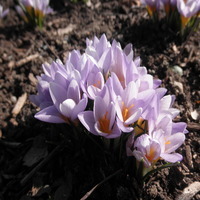 The blooms are less weather resistant than crocus, and snow and temperatures above 70 make them go over quickly. Actually temperature in the 30 through low 60s make most bulbs last longer than warmer temperatures. Sternbergia candida is a lovely white flowering bulb in the Amaryllis family. It is rather rare in gardens, as all Sternbergia are CITIES listed meaning permits are needed for them to cross international borders. This is done in part to curb the widespread collection of bulbs out of their native habitats. Many species of bulbs are still in dangered of extinction through gathering for the horticultural trade, and habitat loss. 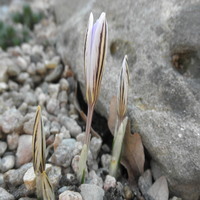 Enjoy the photo of the Sternbergia is it is in a part of the garden not acessable to the public. 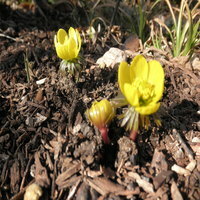 Eranthis hyemalis is the last bulb featured this week. A member of the buttercup family you can see the resemblance to several of our native buttercups found in the high country. On a side note the buttercup family has been broken up and Eranthis maybe in the hellebore family. This cheery little gem is under the Magnolia at the east entrance of the Rock Alpine Garden. Staying in the same family but departing the bulbs, is Pulsatilla vulgaris or pasque flower with its deep lavender or purple blooms. The word pasque is French for Easter and refers to the general bloom time. 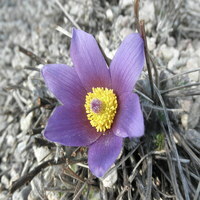 Soon it will be time to find our native pasque flower Pulsatilla patens in the foothills. 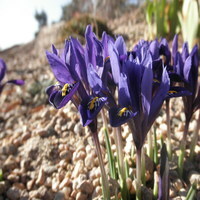 Pasque flowers can be found throughout the Rock Alpine Garden. 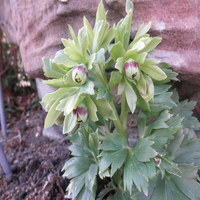 Helleborus vesicarius, a feature of a blog several weeks ago is now in full bloom, as you can see it is a far departure from the open blooms of Lenten roses (Helleborus x hybridus) or Christmas roses (Helleborus niger), but it has its own charm. Spring is well on its way.